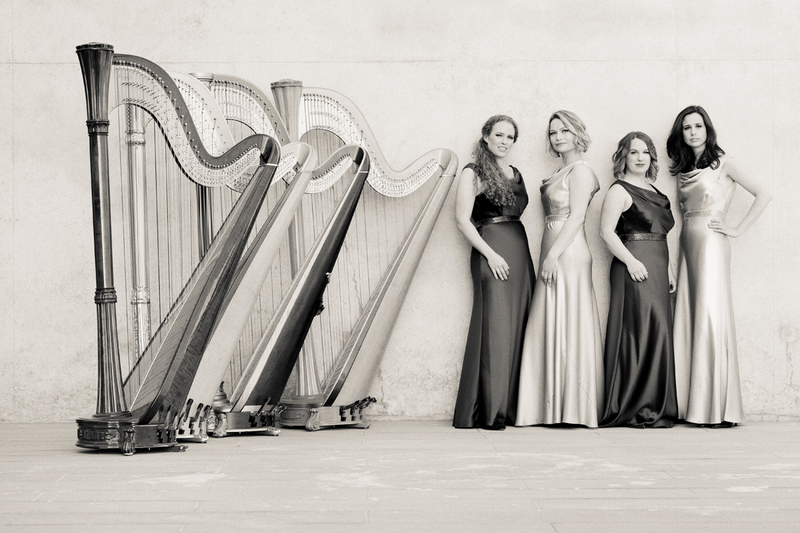 Since their formation in 2000, 4 Girls 4 Harps have been heard in numerous venues and festivals in the UK and across Europe, delighting audiences with their dynamic performances and innovative repertoire. The quartet has featured on BBC Radio 3, BBC Radio 4, BBC Radio 2's Friday Night is Music Night, Classic FM and Welsh television channel, S4C. They have performed at The World Harp Congress in Dublin, The Fairfield Halls, St Georges, Bristol and at London's King's Place. Harriet Adie, Keziah Thomas, Eleanor Turner and Elizabeth Scorah are four harpists who have a shared goal of presenting new works and their own idiomatic transcriptions to show off the full scope of four concert harps. Many original works have been commissioned by the group, helping them to establish themselves as the leading harp ensemble in Europe. 4 Girls 4 Harps debut album, 'Fireworks and Fables', was released in 2009 and showcases their own arrangements of impressionist works by Ravel and Saint-Saëns as well as new works by the group's own composers Harriet Adie and Eleanor Turner. Well received by critics, it is regularly broadcast on national and international radio. December 2013 heralded the release of the group's second album, '4 Girls 4 Harps at Christmas', an ambitious project which included a fourteen date concert tour of venues in London and the South-East including Temple Church, Herstmonceux Castle and Asylum Arts in London. Described by the Sunday Express as 'putting the harp back into the heart of Christmas', the album was also favourably reviewed by BBC Music Magazine who wrote 'Ensemble is watertight and there is a real rhythmic élan to the playing which keeps you listening'. 2015 heralded the ensemble's 15th anniversary as a quartet. On top of live broadcasts on BBC Radio 3's In Tune and BBC Radio 4's Woman's Hour, they celebrated this milestone with a performance of the World Première of an exciting new commission, Tetra, composed by four female British composers. The commission was generously funded by the PRS for Music Foundation's Women Make Music, The Ambache Trust and RV Williams Trust. In addition, they also founded the British Harp Chamber Music Competition (the only competition of its kind in the UK) to encourage other young harpists to perform chamber music and to champion the harp in a chamber music setting.